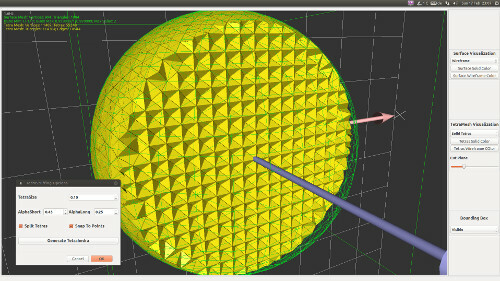 Developed by Dennis Lübke, this open-source software is based on Qt and allows for both Windows and Linux to generate tetrahedral meshes for finite element simulation from various surface mesh formats. It also offers a fast and easy-to-use mesh viewer based on QGLViewer and allows basic mesh manipulations (currently only scaling is possible). Two different methods for tetrahedralization are possible: Delaunay Triangulation and Johnathan Shewchuk’s Isosurface Stuffing algorithm. This work is released as GPL software. Surface mesh import and export for *.obj, *.ply, *.off, *.stl (using trimesh2). Import and export of tetrahedral meshes in (a simplified subset of the) GMSH format *.msh (compatible with the SOFA Framework). Two different methods for tetrahedralization: Delaunay Triangulation (CGAL implementation) and Johnathan Shewchuk’s Isosurface Stuffing: Fast Tetrahedral Meshes with Good Dihedral Angles (implementation taken from the SOFA Framework, non-graded variant only). Cutplane view for tetrahedral meshes. 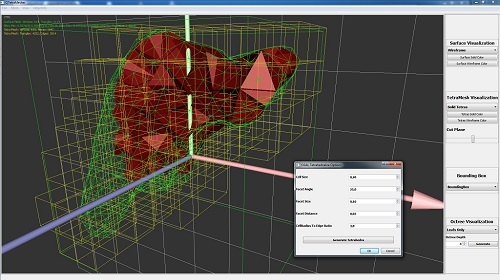 Export the surface of a tetrahedral mesh. Read more on the QTetramesher webpage.